As soon as I get this card in my tarot spread. My heart skips a beat and it knows somehow I would be disheartened. How aptly this word can relate to this card! 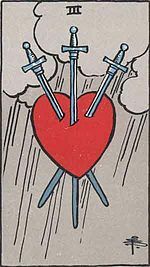 The visual impact of three swords pierced in the heart itself is nerve racking. Maybe you would get to know of something that might break your heart or someone might say something harsh to you. A job opportunity or travel or relation gives you pain. Someone close gossiping about you. Your lover’s dark secret revealed. It’s not just where happenings fall below your expectations but true pain. People mostly fear of this kind of pain only, but once that fear is met, they are free. As when heart is pierced it does set free the entire negative felling which like venom is poisoning the heart. Also you might finally know the truth that your intuition might have been hinting and you have been ignoring. So take a deep breath and swallow it and don’t ignore those signals. The next thing I seek as soon as this card comes is how long and what would be the lesson. 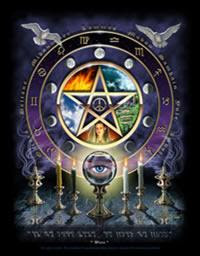 I also further analyze the card whether it would be a specific person, or specific result. How long would the effect be. How or what can I do to mitigate the effects.